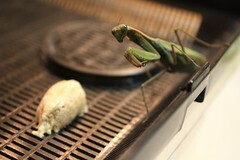 I woke up to find that my pet Praying Mantis, Clingie laid another ootheca (egg sack) last night. I took out the first one and placed it outside because I didn’t want them to hatch until the spring. I was kinda surprised that she had another ootheca. I wonder if the eggs were fertilized and were just inside her, or if they are not fertilized… similar to how hens will lay eggs even if they are fertilized. Later in the afternoon, me and my Mom went shopping. Went to Costco and got food for Christmas. They went to Island Pacific… Then afterwards ate at Subway… or as my Mom would call it "Footlong". This entry was posted in Uncategorized and tagged garden, praying mantis, slice of life. Bookmark the permalink.